The morning’s first light dawns purple, builds to a soft pink, then strawberry red. Crickets and other night creatures punctuate the mild air; the birds are quiet. As the sun climbs the eastern horizon, its light flares and glows green in the tops of river birches, maples and cottonwoods. 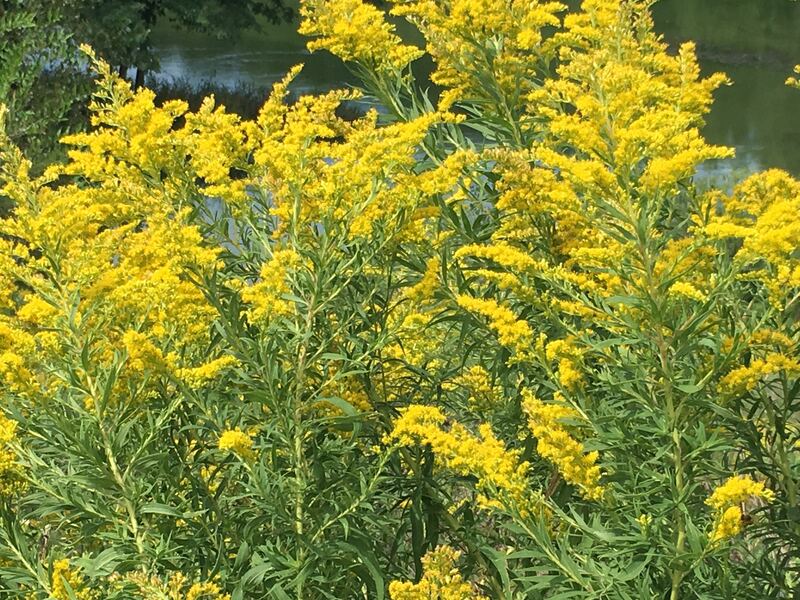 There is only a hint of autumn color in the trees, but the wildflowers are dominated by gold — the gold of woodland sunflowers, goldenrod, a few butter and eggs. 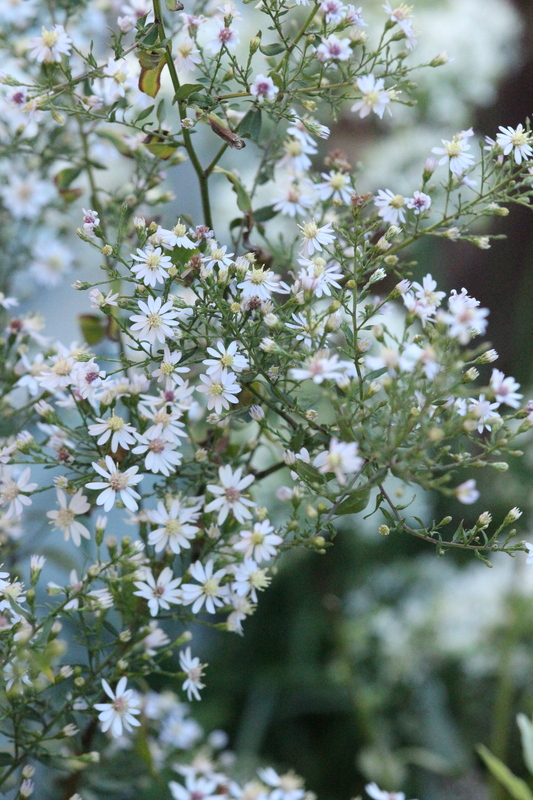 The first asters, purple and white, softly accent the gold. In the coolness of the morning, voices of early walkers rise from the sidewalk. “A beautiful morning for a walk!” women call in greeting to each other. 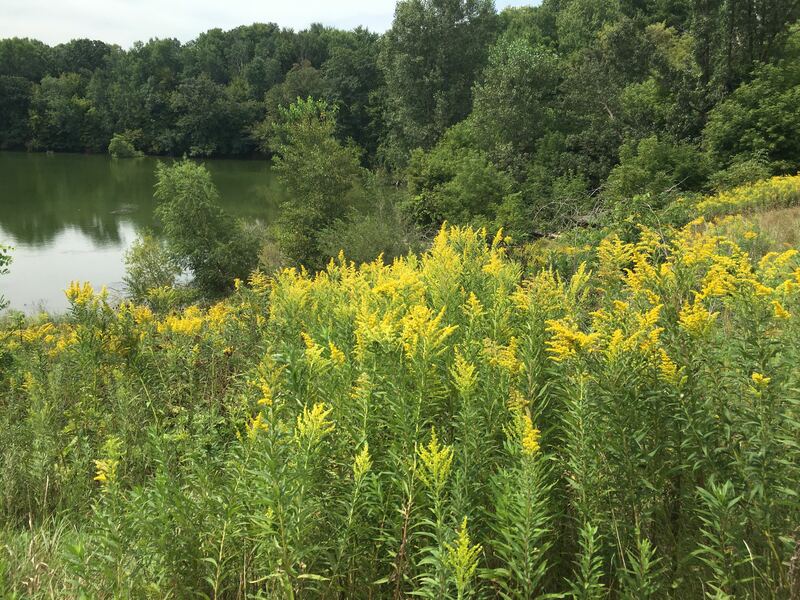 Plumes of Canada goldenrod (Solidago canadensis) surround a pond. 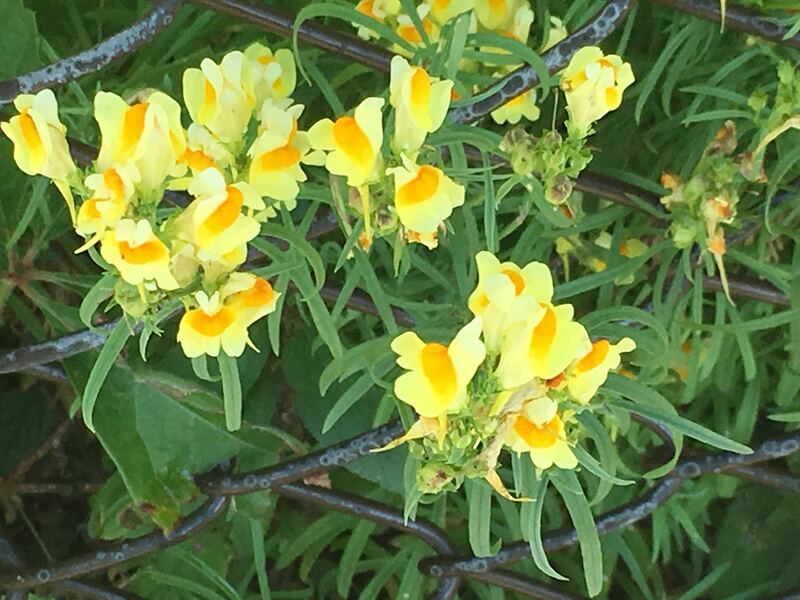 Butter and eggs, (Linaria vulgaris Mill) was introduced by European settlers in the 1800s. 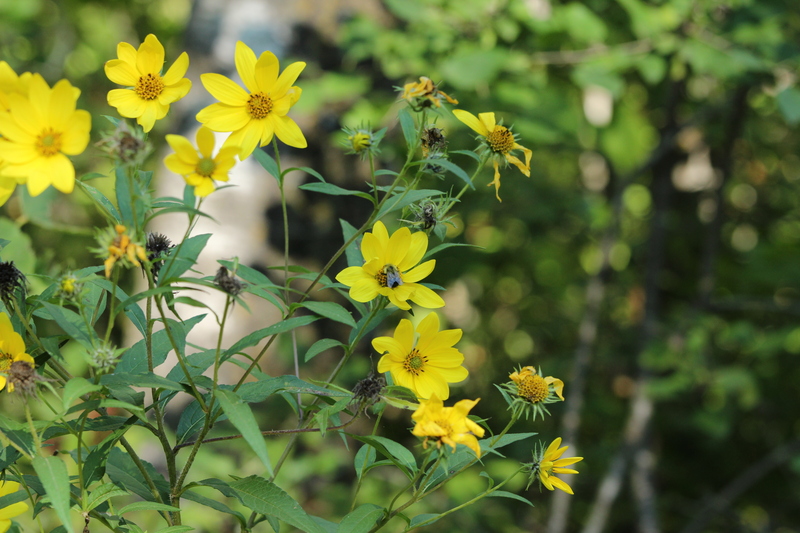 Its bright flowers are now considered invasive. Native heath asters (Symphotrichum ericoides) are at their peak bloom now. Later, in the afternoon, I walk the hilly paths. The sun is warm, an easterly breeze is mild. Barn swallows twitter overhead, swooping and soaring in pursuit of small insects. At a nearby pond, a dozen Canada geese perch on a half-submerged snag and a green heron alights briefly at the tip top of a skeletal maple. Close to the ground, small butterflies flutter across the wildflowers bordering the pond. 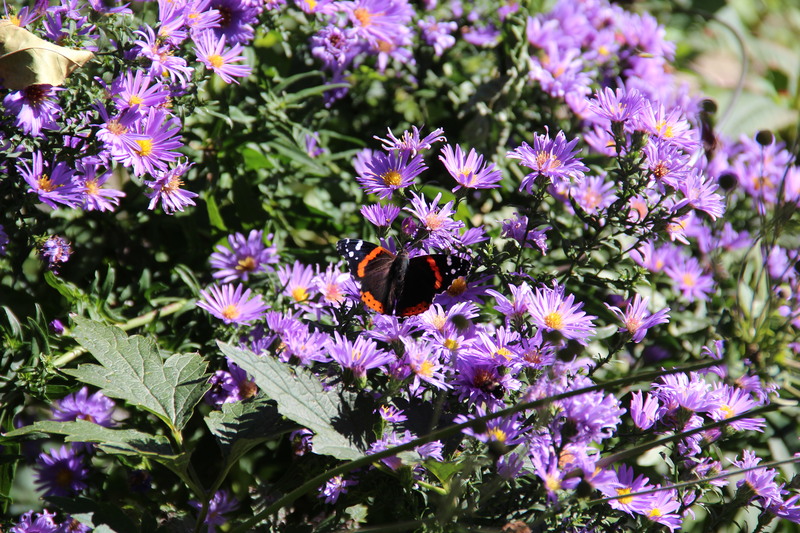 A red admiral (Vanessa atalanta) sips nectar from New England asters (Symphotrichum novae-anglica). I sit in the sun to breathe in the peaceful scene and soak up the sunlight. Its radiant heat soothes and relaxes. I miss it so much during the long winter. I wish these late-summer afternoons would never end. I am grateful to be outside surrounded by this abundance of life.